Our Boston personal injury lawyers know rules of evidence can lead to complex litigation. In Lee v. Smith & Wesson Corporation, the plaintiff was injured while shooting target practice with his revolver manufactured by the defendant. The plaintiff fired two shots without incident and, on the third shot, was severely injured when the gun hit him in the eye. According to the plaintiff’s testimony, the cylinder that holds the bullets swung open after the shot was fired due a manufacturing defect and hit him in the safety glasses. The safety glasses broke, causing significant trauma and loss of vision to his right eye. The defendant, on the other hand, claimed there was nothing wrong this gun, and the plaintiff was hit with the gun due to standard recoil. The defendant removed the case to federal court. Central to this case is the intention of the plaintiff to introduce the expert testimony of a material scientist. The expert witness was to testify the revolver was defectively designed because pulling back the hammer with the trigger depressed, even if the cylinder wasn’t locked into place, could fire the gun. 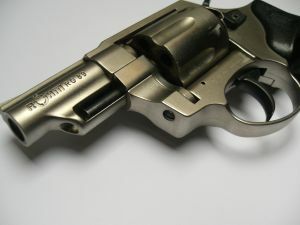 With the cylinder not properly engaged, the explosive gas created when the gun is fired could cause the cylinder to blast open, causing the injury suffered by the plaintiff. He also planned to testify the gun was defectively designed because the ejector rod that pushes out spent casings when depressed was loose, which could prevent the cylinder from closing properly. The expert also expressed an opinion that the defendant had failed to adequately warn customers of this obvious danger. The defendant moved to exclude the plaintiff’s expert on grounds that his opinion was demonstrated through an accident reconstruction that did not match the plaintiff’s own account of what had happened. The trial judge agreed, and excluded the plaintiff’s expert. On appeal, the court held that the plaintiff’s expert witness should have been permitted to testify. His testimony was based upon readily acceptable scientific methods, a review of the medical records and a physical examination of the gun. A reasonable finder of fact could listen to the expert’s testimony and conclude it was more likely than not his opinion that the gun was defective or that the manufacturer had failed to adequately warn customers was correct. Alternatively, the jury could conclude the expert’s testimony did not in fact match the plaintiff’s memory of the events and hold the company not liable. The point is the court should allow the expert’s opinion to be presented to the jury, so they can judge the credibility of the opinion. Just because it is possible that some piece of evidence may not be convincing does not mean it is not admissible in a personal injury case. As your lawyer can explain, if something tends to prove an event is more or less likely to have happened, it has met the very low threshold of being relevant. These are complicated issues that your personal injury attorney can explain, as they may or may not relate to the facts of your particular case.